Personalised Mother's Day Gift for the 'Bestest Mum' - Fabric Heart - choice of fabric - Gift Boxed. Baby Girl Gift - Personalised Heart Produced in Your Choice of Fabric. Supplied Gift Boxed. Newborn girl present. 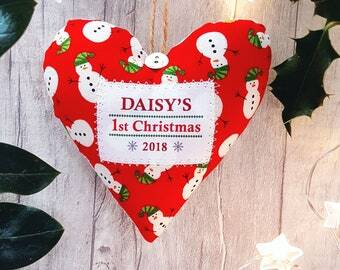 Announcement Personalised gifts for all occasions - little fabric hearts that make great gifts and presents for new babies, christenings, weddings and many more occasions. Every heart is supplied gift boxed. Personalised gifts for all occasions - little fabric hearts that make great gifts and presents for new babies, christenings, weddings and many more occasions. Every heart is supplied gift boxed. Mr and Mrs Personalised Wedding Gift / Wedding Present. Fabric Heart Decoration / Ornament. Choice of Fabric. Gift Boxed. Thank You for being a Great Teaching Assistant Gift -Choice of Fabrics - Gift Boxed - Scented Fabric Heart. Rustic Wedding Decor / Personalised wedding gift. Choice of fabric. Gift Boxed. Personalised Flower Girl Gift. Choice of fabric. Gift Boxed. Wedding party thank you. Ruby Wedding 40th Anniversary Gift - Personalised Heart Made in Your Choice of Fabric. Supplied Gift Boxed. Baby Remembrance Ornament / Infant Loss Keepsake - Fabric Heart made in your choice of fabric. Thank You for being a Great Teacher Gift - Choice of Fabrics - Gift Boxed - Scented Fabric Heart. 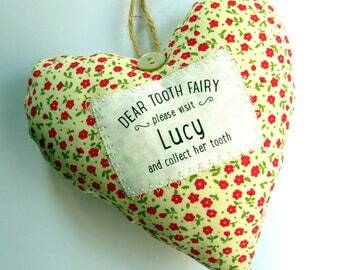 Personalised Girl's Tooth Fairy Pillow / Cushion Gift Boxed. Fabric heart personalised with child's name. Door Hanger. Golden Wedding 50th Anniversary Gift - Personalised Fabric Heart Made in Your Choice of Fabric. Supplied Gift Boxed. Silver Wedding Anniversary Gift - 25 years married - Personalised Heart Made in Your Choice of Fabric. Supplied Gift Boxed. Delighted to introduce our new fabric range. All listings will be updated with new options over the next few days. New packaging sorted. Every order will be sent out beautifully presented in a pretty little gift box. A small section of my tiny garden studio where all of the sewing action takes place. I often come up with the idea for new products when looking for gifts to give myself. I needed a gift for a friend's new baby and I wanted it to be beautiful, meaningful, not too expensive and also easy to post without worry that it may be damaged enroute and that's where the idea for Wordheart was born. Wordhearts are the perfect little keepsake gift available in lots of different designs suitable for all occasions. If you need something unique - just get in touch! Each little fabric heart is carefully designed, stitched and packed by myself.